An ambitious attempt to determine from oral histories the effects of the slave trade on West Africa and its people, especially those in coastal Ghana. Bailey (African History/Spelman College) well realizes the tenuousness of the project. And although she states early that she wants to do a “full and thorough analysis” of oral records, she admits that she can “in no way” characterize her work as definitive. Her research and results are important but understandably very fragmentary, and, although her stated purpose is to focus on oral accounts, she expends much effort and space dealing with the textual records on both sides of the Atlantic, displaying a true scholar’s familiarity with significant documents and with the published accounts of her predecessors. 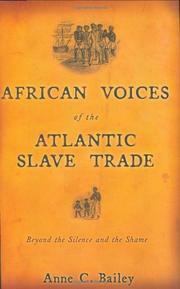 Bailey rehearses the history of the Atlantic slave trade, citing its evils, indignities, and cruelties. (See other recent treatments of this subject, e.g., Bury the Chains and The Queen’s Slave Trader.) She moves on to the vexing questions of the involvement of Africans in the capture and sale of other Africans and the practice of slavery among the West Africans. (She also looks at the ongoing contemporary problem of the religious enslavement of women, voicing her strong disapproval of the tradition.) Bailey reminds us that the partnership between the West Africans and the white traders was not an equal one, and that the desire for economic security and for European trade goods were inducements too powerful for many to resist. She takes a hard look at the deleterious effects of slavery on the cultures both of the captives and of those who were left behind, finding lingering evidence even today in the political instability and religious secrecy of the region and showing how the guns-for-slaves exchange exacerbated the violence among the West Africans. Bailey is not a graceful prose stylist—she raises syntactical and stylistic barriers for readers—but her research is important, her questions provocative, and her arguments sensible.